You forgot to mention that despite Montoyas win, the big story from Infineon is how good Jeff Gordon did finishing seventh. Sure he started in forty something, but Montoya started in thirty something and WON. Rednecks indeed. My mistake. Apparently the big deal wasn't where Gordon finished, but that he may face sanctions because his car wasn't blahblahblah the same enough for the race. I wonder if this is the seasonal equivilant of a competition caution. Nice way to bring your points leader back closer to everyone else. What's hilarious is the fact that 90% of the irate idiots hating on Montoya call boo him for being "Mexikuhn" when in fact he's Columbian. He pretty much won the race on a fuel mileage fluke, but hey, anything to hork that crowd off and keep Montoya's antics from spoiling F1 is quite alright with me. I'm just glad Montoya won because I had him picked this week in fantasy NASCAR. He's been doing more wrecking than winning of late, but I still gave him a chance. I won't be picking him again until Watkins Glen, though! As delicious as it may be to consider SeaBass in a tin top, most reliable sources are already saying he's signed with the Scuderia Toro Rosso F1 team likely displacing sole American F1 driver Scott Speed. 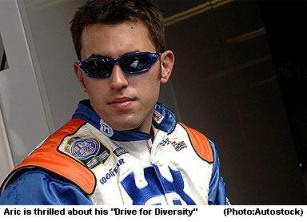 I'm sure some NASCAR team will be able to find him some kind of sweet development deal though.